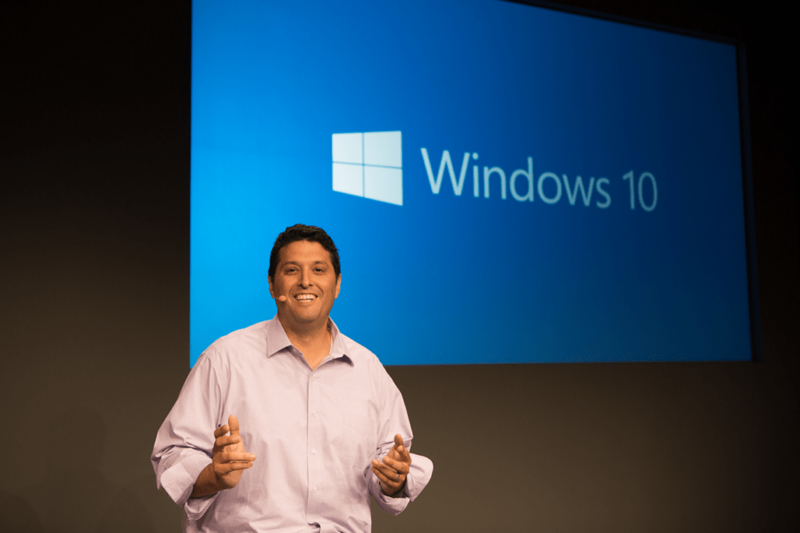 Terry Myerson, the executive vice president of Windows, is to leave Microsoft "in the coming months". Myerson has been at Microsoft for 21 years, and has been involved in Windows Phone, Windows 10, Xbox One, and Surface devices. His departure is part of a large reorganization at Microsoft that sees Rajesh Jha, the executive VP of Microsoft Office products, expanding his responsibilities to take over Myerson's role, and Panos Panay serving as the company’s Chief Product Officer. In an email to staff, Microsoft CEO Satya Nadella spoke of Myerson’s departure, saying: "His strong contributions to Microsoft over 21 years from leading Exchange to leading Windows 10 leave a real legacy. I want to thank Terry for his leadership on my team and across Microsoft." You can read the full email to employees at the bottom of this story. Technology really can empower people to do great things. While that may just sound like a soundbite, the last few years I have felt it in new and meaningful ways, making me a real optimist about our future. Amongst so many other things, Windows has been a platform to consider basic human creativity, how students will learn in the future, how surgeons can will operate in the future, and how people who are blind can use their device without a display. Broadly define who is on your team. The passion, commitment, and sheer brilliance of the people across Microsoft has kept me inspired for 21 years. I am so proud of the teams I have had the honor to lead. Windows has taught me to appreciate that some of my best teammates are at other companies like Intel, Dell, HP, Lenovo, Asus, Acer, AMD, Qualcomm, Samsung, Best Buy, Adobe, Autodesk, Activision, Electronic Arts, and so many others. We have worked together to move the industry forward, creating opportunity for so many along the way. Have fun with it. My Microsoft journey has included some challenging days, but I barely remember them. Looking at a photo collection today, I see so many self-deprecating moments where our leaders have had some real fun. I have dressed up as Big Bird, a clown (a few times), Captain Kirk (twice), and Santa. I’ve been thrown in a lake (a few times). I have dressed as Braveheart’s William Wallace and ridden a live horse into a team meeting (once). I have laughed so hard I’ve cried (many times). I will cherish these memories of sheer fun with the team as much as anything else I take away from my 21 years at Microsoft. Myerson’s departure will be a big loss for Microsoft, but it’s clear that Satya Nadella is looking to shake things up, and it will be interesting to see what the future holds for Windows 10. Today, I’m announcing the formation of two new engineering teams to accelerate our innovation and better serve the needs of our customers and partners long into the future. Over the past year, we have shared our vision for how the intelligent cloud and intelligent edge will shape the next phase of innovation. First, computing is more powerful and ubiquitous from the cloud to the edge. Second, AI capabilities are rapidly advancing across perception and cognition fueled by data and knowledge of the world. Third, physical and virtual worlds are coming together to create richer experiences that understand the context surrounding people, the things they use, the places they go, and their activities and relationships. These technological changes represent a tremendous opportunity for our customers, our partners -- everyone. With all this new technology and opportunity comes a responsibility to ensure technology’s benefits reach people more broadly across society. It also requires that the technologies we create are trusted by the individuals and organizations that use them. Today’s announcement enables us to step up to this opportunity and responsibility across all our Solution Areas. With change comes transition, and one transition we have been planning for is for Terry Myerson to pursue his next chapter outside Microsoft. Terry has been instrumental in helping me arrive at this new organizational structure, and I deeply appreciate his leadership and insight as we’ve worked through the opportunity that lies ahead. Over the past several years, Terry and the WDG team transformed Windows to create a secure, always up-to-date, modern OS. His strong contributions to Microsoft over 21 years from leading Exchange to leading Windows 10 leave a real legacy. I want to thank Terry for his leadership on my team and across Microsoft. He will work with me on the transition over the coming months. Devices: Panos Panay will now serve as our Chief Product Officer and will lead our devices vision and further our product ethos across hardware and software boundaries for our first-party devices, while creating new categories and opportunities for the entire ecosystem. He will be the key leader ensuring end-to-end devices business execution excellence. Windows: Joe Belfiore will continue leading our Windows experiences and will drive Windows innovation in partnership with the PC and device ecosystem. The future of Windows is bright as we continue to innovate across new scenarios and device form factors, and more deeply connect to our Microsoft 365 offerings. Joe will share more about the Windows roadmap at Build. New Experiences and Technology: Kudo Tsunoda will continue to lead this team to define how we engage users with high-value experiences to help them achieve more. Enterprise Mobility and Management: Brad Anderson will continue to lead our Windows Enterprise deployment and management efforts with even tighter alignment across Microsoft 365 and will partner closely with the EMS teams within Cloud + AI Platform. Azure: Jason Zander is being promoted to executive vice president, Azure, and will lead this team. The Windows platform team led by Harv Bhela, Henry Sanders and Michael Fortin will join Jason’s team. Windows platform is already a core part of Azure across both the cloud and edge, and this shift will enable us to accelerate our efforts to build a unified distributed computing infrastructure and application model. Roanne Sones will continue to lead our technical engagement with OEMs, ODMs and silicon vendors, and her team will also join Jason’s team. Business AI: The Customer Service, Marketing and Sales Insights teams, previously led by Gurdeep Singh Pall, will join James Phillips’ Business Applications Group. I am thankful for Gurdeep’s leadership in building these new AI solutions that are going to help differentiate Microsoft in this area. This is a notable example of taking research breakthroughs to start new product efforts grounded in customer needs and then mainstreaming them. Universal Store and Commerce Platform: Eric Lockard and his team will also join the Cloud + AI Platform team to both help with our own digital transformation and add new capabilities to our business application efforts. AI Perception & Mixed Reality (MR): Alex Kipman will lead this new team, which brings together all our speech, vision, MR and additional perception capabilities into one team. This team will continue to build first-party products and the core building block cloud services for third parties on Azure. XD Huang, Yu-Ting Kuo and their teams will join this group, as well as Gurdeep’s Ambient Intelligence team. Alex and team will take guidance on all AI-related areas from Harry Shum and work very closely with AI + Research (AI+R). AI Cognitive Services & Platform: Eric Boyd will lead this new team and drive our AI Platform, AI Fundamentals, Azure ML, AI Tools and Cognitive Services. Joseph Sirosh and team will join this new group. Eric and team will take guidance on all AI-related areas from Harry Shum and work very closely with AI+R. Harry Shum will continue to lead our third engineering team, AI + Research, which is instrumental in the key technology advances required across all our product teams. When we established AI+R nearly two years ago, our primary goal was to accelerate the adoption of AI innovations from research into product, and the changes we are making today reflect our strong progress. In fact, just yesterday I spent time at TechFest and came away inspired by all the innovations and most importantly how quickly they were making their way into our products. We will continue to drive investments in AI+R across research and AI breakthroughs that are key to our long-term success. As we make technological progress we need to ensure that we are doing so responsibly. To this end, Harry and Brad Smith have established Microsoft’s AI and Ethics in Engineering and Research (AETHER) Committee, bringing together senior leaders from across the company to focus on proactive formulation of internal policies and how to respond to specific issues in a responsible way. AETHER will ensure our AI platform and experience efforts are deeply grounded within Microsoft’s core values and principles and benefit the broader society. Among other steps, we are investing in strategies and tools for detecting and addressing bias in AI systems and implementing new requirements established by the GDPR. While there is great opportunity, ensuring we always act responsibly for our customers and partners will continue to be a hallmark of our work. To truly get the best impact from our efforts, we will have to push ourselves to transcend Conway’s law. Having a deep sense of customers’ unmet and unarticulated needs must drive our innovation. We can’t let any organizational boundaries get in the way of innovation for our customers. This is why a growth mindset culture matters. Each one of us needs to push on what technology can do for people and for our world. It will take courage to keep learning and growing together — encouraging one another’s individual strengths, building more diversity and inclusion across our teams, and collaborating as One Microsoft. It’s amazing what we have been able to accomplish together, and yet I still believe we are in the very early days of what is possible. We’ll talk more about these changes at the Q&A next week and the important work ahead.